Unity's Hip Hop this week was all about Easter. How fun! It's coming you know? And you know what else Easter means? That's right, Lent will be over and I can buy supplies again. :) But enough about me and my selfishness! At the Unity Hip Hop, they released a new stamp designed by my good friend Lindsay Spencer. It's on her blog and so stinkin cute! I love it! And Unity's having a 30% off sale. Yeesh, can you say amazing? Anyhow, my first card is made for the Unity challenge to make a card with an oval on it. This is also for the Limelight Sketch. The challenge over at Limelight was to use their sketch and something fuzzy or fluffy. I don't have any flock so I went with this fuzzy felt ribbon. 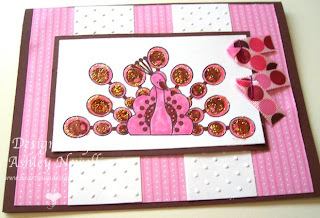 And in the theme of all things pink and blingy, here's my next card. Did you know there was a moment on Thursday when I thought I was over using pink and bling?? Can you believe it? I actually thought about giving them up or cutting back. But then I remembered that no one would believe that they are on my blog if there was no pink and bling. This card is for the Cafe Mojo challenge to use your stapler! I love my stapler! It's pink. And I have pink staples for it, can you tell? They are hot pink! SO cute! Anyhow, my friend Carole sent me these images of Petey the Peacock from Unity's KOTM. I would have cut him out but my hands were a little shaky from drinking coffee on Wednesday when I made this card. (That was the day Brady woke me up at 5am.) But it's pink and covered in Stickles, what more could you ask for from me? Anyhow, happy Hip Hop Hangover day and I'll be back in the afternoon with the EtsyInspired winner. You have until noon Pacific time to enter! These are mahhhhvelous! I love the egg and I think that little peacock is so cute but I never know what to do with him! You've done him justice and than some! Beautiful work! love 'em both, Ashley! over, pink and bling-glad to see you're not! lol! TFS! have a great weekend. Fabulous PINK cards! :) That egg stamp is so pretty and I love the felt ribbon you have! Great cards! Of course I love them, as they are PINK!! LOL! I don't know how you have time to juggle all you need to with little ones while also finding time to create such nice cards. When my daughter was little, I felt like I was running around with my hair on fire ALL THE TIME. And yay, double yay to PINK! Very cute cards...lov'in the pink!!! 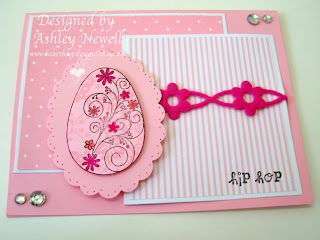 Ashley I simply love that Egg card it is so so so pretty!!! I like the peacock too!!! Your coloring is wonderful!!!! GO PINK! Love them both! i love all the pink - great cards! Fabulous cards(fun to see that peacock!!) And your little ds is adroable with his books!! You're too sweet. Very cute card! These are so pretty! Love the pink! I'm beginning to think I *need* some of these Unity stamps! the peacock is so cute! Very cute cards -- LOVE the images and the colors -- so pretty!!! These are adorable. Love them both.